The Athens Partnership, a nonprofit organization established in 2015 to address pressing needs exacerbated by the economic crisis through public-private collaboration, released its first Biennial Report detailing outcomes to date. Twenty-four public schools remodeled; 25 schools opened with free community activities; 6,000 sq meters of graffiti removed in the city center; and the development of an online case management system serving 40,000 beneficiaries – these are just a few of the results a new wave of public-private initiatives has achieved for the City of Athens. The Athens Partnership estimate over 70,000 Athenians have been directly impacted as a result of its programs to date. In partnership with the Municipality of Athens and theTechnical University of Crete, and with a grant from the Stavros Niarchos Foundation, the Athens Partnership launched “Designed for Better Learning”, transforming 24 schools, inside and out. Τhe Chanion multi-service clinic was the first public clinic to offer health and social services under one roof, free for all. “The Athens Partnership’s scope has gone far beyond channeling aid rapidly and transparently to address pressing needs. AP projects are now offering model solutions to chronic problems in Athens, as well as helping create new opportunities for the city’s rebirth. Thanks to lead support from the Stavros Niarchos Foundation, our partner and donor base has now grown to encompass individuals, foundations and companies who want to offer funds and expertise to achieve effective public-private partnerships with lasting impact”, says Alexandros Kambouroglou, Executive Director of the Athens Partnership. Collaborated with school community to remodel 24 public schools (impacting 4,215 students and teachers), providing not only upgraded physical spaces but helping build a personal bond between students and their schools and creatively reimagining learning activities. Transformed the city’s Commercial Triangle from an overcrowded central neighborhood into a model city center by cleaning 6.000 sq metres of graffiti, pedestrianizing streets, and incorporating public art, while engaging participation from the local community to ensure sustainability. The Commercial Triange project is removing tags, cleaning and pedestrianizing streets and engaging the local community to create a model city center in Athens. Organized the pilot operation of a municipal health clinic in Kypseli, central Athens, which for the first time provides health and social services under one roof, free of charge (15,000 residents served to date). 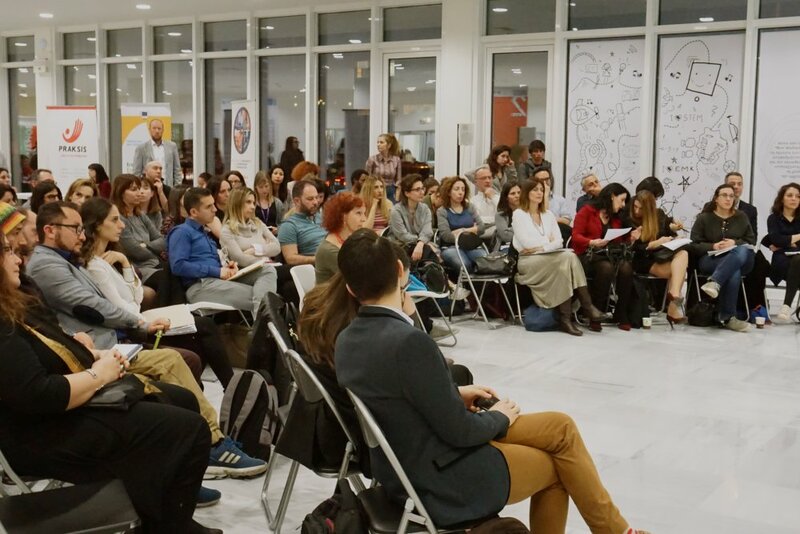 Enhanced the City’s refugee response through the creation of the Athens Coordination Center for Migrant and Refugee Issues (ACCMR) by bringing together 75 organizations to strategically address needs. The ACCMR is the first of its kind in the country. Strengthened economic development through a new Athens Tourism Partnership (ATP), bringing together Aegean Airlines, Athens International Airport and the Hellenic Initiative, that supported a multi-media campaign reaching over 34 million potential travelers. Through the ATP's Greeters program, 124 volunteers personally welcomed over 70,000 visitors at key city hubs. Read our Biennial Report here. In addition to its antiquities, Greece is renowned for its severe economic crisis and the accompanying frightening statistics that demonstrate its harsh impact on residents: 50% unemployment rate among young residents; 15% living in extreme poverty. In addition, beginning in 2015 Greece was faced with an international humanitarian crisis as fleeing refugees flocked to the country, further draining the country’s limited resources. The creation of the Athens Partnership strengthened Municipal services, by forging alliances with private sector partners. With the public sector under huge strain, cutting down even on the most basic services, many Greeks in and outside of the country stepped up and asked, “How can I help?” Unfortunately, good intentions and a desire to help do not always translate to impactful and lasting results. When it comes to philanthropy, many challenges stand in the way, such as how to coordinate and direct private investments in an efficient and effective way, and how to make meaningful and sustainable change. Enter: The Athens Partnership (AP), which was formed in 2015 to tackle these challenges and to leverage the existing services and resources of local government. An early advocate for the AP model, the Stavros Niarchos Foundation committed 10 million euro to support the Municipality of Athens and entrusted AP to administer its generous grant for the benefit of Athenians. After two years, AP launched over a dozen impactful programs garnering the support of many donors and project partners. Our Biennial Report features a robust description of the cross-sector programs launched in coordination with the City of Athens and the outcomes to date. What is more difficult to convey is how AP has helped to rethink and reawaken some of the City’s essential services, developing a new framework for collaboration, transparency, and accountability. Transformational programs: in Designed for Better Learning schools, 77% of students report leaving school happy. For instance, Designed for Better Learning could have been a simple renovation of public school buildings in dire need of attention, however, working with the Technical University of Crete, we reimagined a new way of teaching, learning and community engagement. Twenty-four schools (5% of City schools) were transformed and new activities, co-created with students, were embedded such as IT training and DIY construction. AP has received over 40 requests to replicate this program. Transformational results were also achieved in our Commercial Triangle initiative, which helped turn around a crowded city center filled with tags into a new vibrant area, boosting business conditions and attracting tourism. It took cleaning 6.000 square meters of walls and storefronts, removing illegally parked cars, creating new pedestrian streets, and most importantly, working closely with local business owners and residents on every step to ensure success and sustainability. Reshaping the heart of Athens: the Commercial Triangle program is removing tags and cleaning walls and storefronts, creating new pedestrian streets, in cooperation with local business owners. Addressing one the most pressing emergencies in Athens, the Athens Partnership became a catalyst to public and private efforts assisting refugees and migrants. The creation of the Athens Coordination Center for Migrant and Refugee Issues enabled the City of Athens to assume a proactive role in the coordination of 75 NGOs and government agencies—helping to identify gaps, avoid duplication of efforts, promoting the integration of migrants and refugees as well as preparing for a possible future emergency. This program has fundamentally begun to change the way resources are channeled to address the refugee crisis, building synergies between private and public sector partners. Above all, the success of the Athens Partnership is good news for the City Athens and its residents—new and old. As noted in our Biennial Report, over 70,000 Athenians have been directly served by the work of the Athens Partnership since its launch. We are confident this is only the beginning. We are deeply thankful to our growing list of partners and donors committed to the health and well-being of Athenians and our country. In spite of the challenges we face, we can only be optimistic about the future: by harnessing this powerful mix, there are no limits to what our City can achieve ahead! Volunteer Athens Greeters give a warm welcome to the world! As Athens neared a record-breaking 5 million visitors this year, our "Greeters program", coordinated by the Athens Partnership, made sure a warm welcome awaited tourists. A huge thank you goes to out to our 120 enthusiastic volunteers who were engaged in this City of Athens project that was successfully completed a few days ago with the support of The Hellenic Initiative, Aegean Airlines and Athens International Airport. This video shows how the Athens Greeters are shared their love for their city and their intimate knowledge of Athens with the world! The Athens Greeters program is part of the Athens Tourism Partnership, a wider effort to boost the tourist influx and local economy. The Athens Tourism Partnership aims to promote the Greek capital as a modern, attractive year-round destination.